The three times I used Shiva’s surgery as an excuse for asking another dog owner to re-leash his or her dog. The fact I wish I had thought of this sooner. I spent the extra bit of money I had for this month on symphony tickets instead of savings. The fact that I almost wish our Christmas this year would be as quiet as previous years. As lovely as it will be to spend the holidays with family, the coordination makes my head ache. The Nanaimo bar I ate for lunch. My cat. I haven’t seen him since I startled him off my chair. No wonder he hates me. Our wee little tree and twinkle lights on the staircase. if I could, I would cover the house in them. Re-reading one of my favourite books from a wiser perspective. December is just one day away. Shiva’s purple polka-dotted coat made by my kind and generous practically mother-in-law. We are so lucky. The yummy roasted potatoes I just had for dinner. 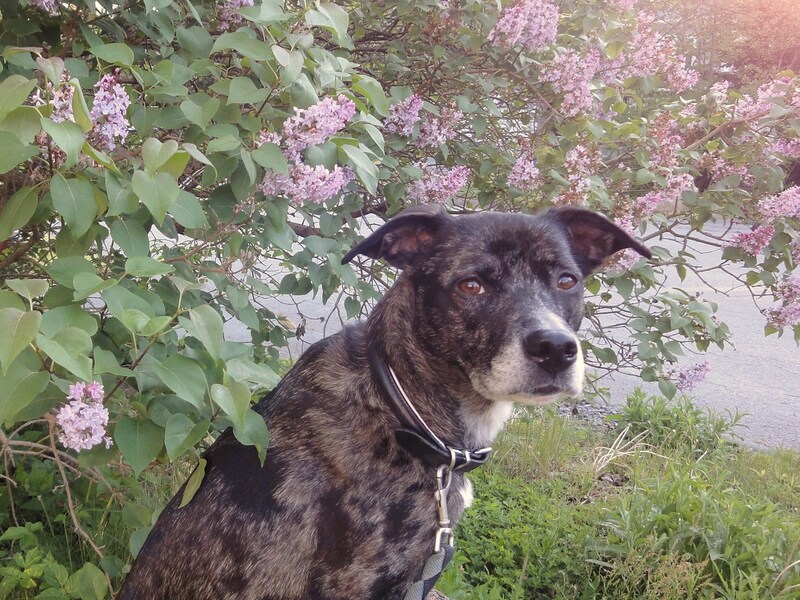 This photo of Shiva with our old lilac bush. Mint chocolate Girl Guide cookies. The thought of giving up my Blackberry. The wish I had blogged more last year so I would have a record of all we experienced. The knowledge that even if I attempt to tell the stories now, they won’t be the same as they would have been. Tomorrow is the last day of Movember. Tomorrow is the last day of NaBloPoMo. I kind of wish it wasn’t. Good list, and I can totally relate to some of those. Hey, we made it through NaBloPoMo. What’s the icon for virtual fist bumps?